Welcome to our Website! We are a small hobby kennel located in the Litchfield Hills of CT. We have been owned by the breed for 20 years. 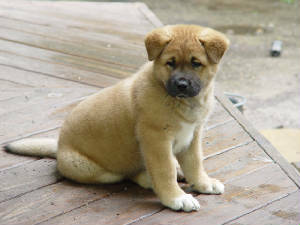 We breed to the Akita standard without compromising temperament. Our dogs are house dogs and pets first, and show dogs second. Please take a look around our site and visit with our dogs. They love visitors! 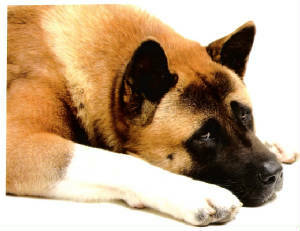 We are members of the Akita Club of America and Association of Pet Dog Trainers (APDT). Please check out the Rally Titles page for recent title photos!! We are very proud of the Rally titles our dogs have received! Our puppies were also featured on Dogs 101 - The puppies were from the Raiden x Sedona breeding! See the Too Cute video below. Reno - Shogitai's Roll The Dice at 8 weeks old. Raiden at 17 months old. 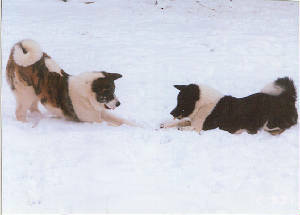 Sierra and Jetta - CH Shogitai's Reason to Believe, TT, CGC, Delta & CH Shogitai's Borderline Angel, CGC, TT, Delta, VA - playing in the snow. Sierra - UKC CH - April 2006! Raiden - UKC CH & NAKC CH - June & October 2006! Jetta - UKC CH - July 2006! Sedona - CGC, Delta Therapy Dog Titles & UKC CH - Feb, Aug & Oct 2006! Ecco - Canine Good Citizen, UKC CH & Delta Therapy Dog Title - Aug, Sept and Nov 2006! Reno - UKC CH & Canine Good Citizen- October 2006! Jan 07 - Raiden finishes his AKC CH! May 07 - Raiden passes Delta therapy dog certification! July 07 - Toshi UKC CH! August 07 - Sierra NAKC CH! 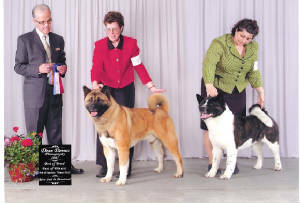 August 07 - Raiden Akita Club of America Versatile Akita Award! October 07 - Toshi earns CGC! October 07 - Jetta NAKC CH! March 08 - Sierra is awarded NAKC Best In Show! March 08 - Raiden is awarded an Award of Merit! April 08 - Onyx UKC CH! April 08 - Raiden earns CPE Standard Agility Title!! June 08 - Salena earns her UKC CH and a UKC Best in Show! October 08 - Raiden earns CPE Fun Games Agility Title! October 08 - Jetta earns CPE Standard and Handler Agility Titles!! October 08 - Jetta earns NAKC Grand Champion Title! October 08 - Sierra earns NAKC Granch CH Title! October 08- Sierra is awarded NAKC Best In Show! April 2009 - Jetta earns Level 1 CPE Agility Title - 8 Qualifying Runs!! May 2009 - Henley earns Canine Good Citizen title (CGC)! May 2009 - Henley earns UKC Championship! June 2009 - Toshi earns AKC Championship!! March 2010 - Raiden earned CPE CSL2-H Agility Title! March 2010 - Jetta earned CPE CSL2-F & CSL2-H Agility Title! May 2010 - Reno earns the Delta Therapy Dog Title! May 2010 - Onyx earns the Delta Therapy Dog Title! Septembee 2010 - Sierra achieves Rally Novice Title! November 2010 - Ecco achieves Rally Novice Title! April 2011 - Sierra achieves Rally Advanced Title! May 2011 - Reno achieves Rally Novice Title! June 2011 - Tegan achieves UKC Championship! July 2011 - Jetta achieves Rally Advance Title! Nov 2011 - Raiden achieves Rally Advance Title! Nov 2012 - Sedona achieves Rally Novice Title! Nov 2012 - Onyx achieves Rally Novice Title! March 2012 - Tegan achieves Canine Good Citizen Title! March 2012 - Aja achives Canine Good Citizen Title! May 2012 - Aja achieves UKC Championship! June 2012 - Raiden achieves CPE Level 2 Agility Title! June 2012 - Jetta achieves CPE Level 3 Agility Title! June 2012 - Onyx achieves CPE Level 1 Agility Title! June 2012 - Onyx achieves AKC Championship! July 2012 - Jetta achieves Rally Excellent Title! July 2012 - Onyx achieves Rally Advanced Title! July 2012 - Toshi achieves Rally Novice Title! August 2012 - Tegan achieves AKC Championship! November 2012 - Raiden achieves AKC Beginner Novice Obedience Title! April 2013 - Tegan achieves Rally Novice Title! July 2013 - Tegan achieves Rally Advanced Title! October 2013 - Onyx achieves Rally Excellent Title! October 2013 - Onyx achieves UKC Rally RO1 Title! October 2013 - Tegan achieves UKC Rally RO1 Title! November 2013 - Aja achieves Rally Novice Title! Please feel free to contact us about our dogs. We can be reached at LSBACCO@aol.com or at 860-379-1594.